Kanban Software for BusinessSimple. Visual. Powerful! 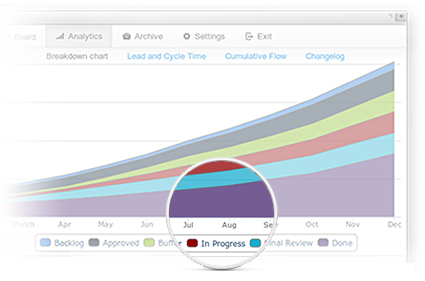 Improve collaboration between your team members and clients using professional Kanban software. Encourage communication among the team members by sharing tasks, information and comments, using notifications and RSS feeds. Kanban software is a simple and powerful solution with Kanban boards and real-time collaboration for distributed teams. It helps companies gain the maximum work visibility and improve productivity and efficiency. Kanban Tool is perfect for improving business results. 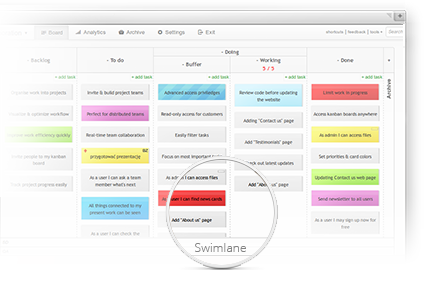 Kanban Tool offers you customizable online Kanban boards with easy to use drag & drop interface. It can be integrated with external systems via API. Our software provides insightful analytics and metrics for monitoring and improving business performance. Try our software and see if it fits your needs. Start with 14 days free trial to test all the features. If you decide to continue using Kanban Tool, simply subscribe to the selected plan and we will charge your credit card on monthly basis.